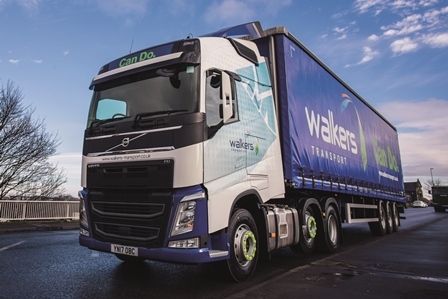 Richard Simpson, CEO of Leeds-based Walkers Transport, is typical of the new breed of logistics business owners who have not been brought up in transport and so have a fresh view of the industry and its future. Walkers Transport was formed in 1977 and until October 2017 was owned by Nigel Jenkinson, the son of the company’s founder. Jenkinson had a clear plan that he did not want to pass on the business to his children and as such took steps to set the business up for continued success in the future. Jenkinson engaged Simpson as a consultant in the first instance and it soon became clear to both of them that one of the best ways to build on the historic success and maintain momentum was to consider a management buy-out (MBO). The three-year plan came to fruition in October 2017 when Simpson completed the MBO backed by private equity firm Total Capital Partners. Simpson had no background in transport and so has few pre-conceived ideas about the industry and its future. As anyone in publishing will tell you, printing is just as tough a market as road transport. “The printing business was interesting because I started it from nothing,” says Simpson. “I bought a start-up franchise and when you’ve got no money coming in you really understand the importance of sales. I did that for three years and then sold it. Simpson’s next venture came about through a chance meeting with someone from a Canadian-owned mobile paper shredding company called Shred-it. “I’d never heard of them and thought it was a con, to be honest, but I did some investigation and it all checked out. I started as Manchester general manager in 2001,” he says. “At the time the business was facing some significant challenges but we got to work and built the business and turned things around pretty quickly. On the back of that, they asked me to take over Shred-it’s business in the UK. When private equity firm Birch Hill Capital bought the company, Simpson took a stake in Shred-it but by 2014 it became apparent that it was time to move on when the company was merged with a large American corporation. “We went from having a really entrepreneurial culture, very similar to what we have here [at Walkers], to being part of a massive corporation,” he says, “and with that, the entrepreneurial spirit seemed to die overnight. Simpson’s next move also came about through another chance encounter, this time with Nigel Jenkinson, then owner of Walkers. “I had known Nigel for years, he went to school with my wife and we used to have a pint together at the cricket club,” Simpson says. “He met my wife in Costa and asked what I was doing. She said ‘he’s doing nothing, he’s a pain in the arse’. So Nigel asked me to come and have a look at his sales team on a consultancy basis. In October 2017 he led a management buyout to give Jenkinson an exit from the business, though the latter remains a non-executive director with a minority stake. Not being a diesel-in-the-veins truck man it is hardly surprising that Simpson is vague about how many vehicles he has on the fleet. A colleague suggests a figure of 90. “Have we really? It’s a bit of a moving feast, it changes every day because we have a number of short-term hires,” he says. “I reckon we also have around 130 trailers across the business including short-term hires. We have never been that interested in owning lots of vehicles – it’s a means to an end for us so the fewer the better! “We have a very definite strategy when it comes to vehicles. We try to keep a good proportion of our vehicles as a variable cost. with a split between owned, contract hired and short-term rentals, The tractor units we tend to contract hire because they get utilised 24 hours a day and after three years of hard work, we don’t really want to own them. Walkers started out delivering air freight out of Leeds-Bradford airport, and now has hubs in Manchester and Birstall in West Yorkshire with its headquarters in Morley near Leeds where our interview takes place. All three sites are leased, the Morley “super-hub” still being owned by Nigel Jenkinson. The company became an early member of Palletways in 2000 and is Palletways’ biggest independent inputter. Around 55% of Walkers’ turnover is through the network. How Walkers are going to do this sounds simple – give customers want they want. “Everything that we do is driven by the customer,” he says. “I’m passionate about giving the customer what they expect and what they deserve. Yes, customers want their pallets delivered but I think that we can do it with care and finesse. It’s about how we represent them to their customers as well. Giving customers want they want might involve Walkers building a network of their own to do more of deliveries on their own vehicles. The boss of another pallet network told MT last year that any self-respecting haulier should look to sell its own door-to-door service first and only use a network when the volumes do not justify direct delivery. “If we’re all being honest with each other the customer would probably prefer to not have their pallet handled eight or nine times,” says Simpson. “I’ve had this conversation with many customers but the big benefit of using a pallet network is cost. Generally speaking, it’s the most cost-effective way, right now. While UK’s pallet networks continue to grow their volumes, competition for members, especially in the South East of England, is becoming intense and some networks are having to buy depots or accept dual running. Since 2013 Walkers’ nine-acre Morley site has been Palletways’ northern hub and the haulier trunks direct to Scotland and London as well as to the network’s central hub in Lichfield. As a major inputter Walkers’ vehicles often run empty back to Morley. Simpson admires what parcels carriers like DPD have achieved in improving the customer experience but knows success isn’t just about clever computer systems. “I don’t think IT is a blocker,” he argues. “You show me a well-run company and I’ll show you a great set of people. Business is a game played by people. If you’re good at people, there’s a good chance you’ll be good at business. Simpson understands that his 170 drivers are the human face of the company, and treating them properly should mean they deliver a better service. One of his first actions when taking over Walkers was to knock down the literal and metaphorical wall that separated drivers and traffic office staff. “Generally speaking, I don’t think the drivers in our industry get the respect they deserve,” Simpson says. “When I first came in, we had something which looked like a bank vault where the drivers came in and talked to the traffic team through a sliding window. We can’t have that culture; the drivers are the most important part of the team and do a great job for our customers. Simpson believes consolidation in logistics, such as the network of independent hauliers built by investment fund Kinaxia, will continue: “This business is about partnerships. If you think you can plough your own furrow you’re probably wrong because other people have tried it and there are many cases where it has not gone too well. At the time of the acquisition, turnover for 2017 was expected to be almost £30m with an EBITDA of £3.7m. Simpson’s goal is to make £10m EBITDA. qualifying that with a laugh and the admission “but I am always a bit ambitious”. Nothing wrong with a bit of ambition.